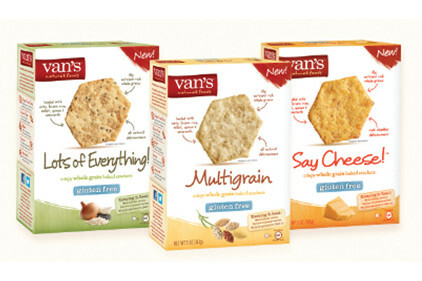 Among the wide variety of crackers, snack bars, and cereals you can purchase with the coupons from Van's are the undeniably delicious Multigrain Crispy Whole Grain Baked Crackers. These delicious snacks are perfect for when you get that craving for something salty. They are light, crispy, and wonderfully salty. You can eat them by the handful since 30 crackers are only 140 calories. Plus, they are jammed packed with whole grains such as quinoa, millet, and amaranth. So not only do these taste amazing, they are good for you, too! Mid-afternoon hunger will be completely banished with these light and airy crackers. The Multigrain have a subtle flavor so you can plunge them into your favorites dips (I tried them in guacamole to delicious results). Slice some of your favorite cheese and stack the crackers high; they can handle it. Instead of indulging in popcorn with a ton of butter, grab a box of these crackers when it's movie night. The best part of this snack is that you can eat to your heart's content without once feeling guilty about it. They are small crackers, but they pack a punch when it comes to great nutrition. You'll feel good about packing these in your kids' lunch boxes as well as taking these to work with you while snacking at your desk. Enter to win a pack of three coupons for FREE Van's products from Van's Natural Foods from 6/23/2013 to 7/7/2013.